Roan Mountain conjures images of dying by hypothermia for me. 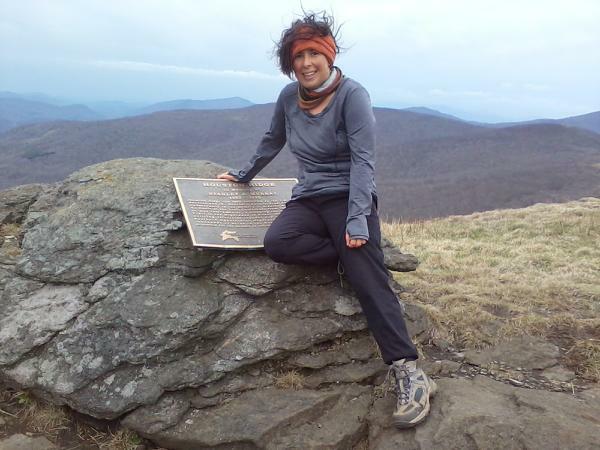 While at my hiking workshop last December, a previous thru-hiker named Hailey shared her experience of being wet and cold to the point of hypothermia symptoms setting in on Roan Mountain. She said her brain wasn’t working right and if it hadn’t of been for the help of other hikers who made her eat and then put her inside her sleeping bag, she might have not made it through the night. This is the story playing in mind when I wake up to howling high winds and a gloomy dark sky with the goal of getting to the top of Roan Mountain by day’s end. I quickly pack up my tent and am grateful when I see my food bag still hanging in the tree where I left it. I walk at a decent pace putting in 5 miles by 10:00 in the morning when I arrive at the Clyde Smith Shelter. To my surprise, there is a party of sorts going on. There is a man named Paul, trail name “Half Price”, who is drinking a hot cup of tea on his bunk. Paul is originally from England and he shares some of his tea with me. Three younger guys in their late teens and early twenties that I had seen the previous week near Erwin TN are cooking a gourmet breakfast of eggs, cheese and wild leeks. Their approach to the trail has been a combination of hiking and partying whenever they come to a town or a hostel with resupplies. Everyone is talking of a storm front coming our way. The forecast is calling for buckets of cold rain. Hailey’s story of Roan Mountain flashes in my mind. The four of them are done hiking for the day regardless of the mere two mile hike they put in from the hostel they slept at last night. They suggest I do the same. I don’t like the idea of stopping before my destination goal and yet, there is no way I will make it uphill to the top of Roan Mountain before the storm. I claim a bunk space in the shelter and pull out my food bag to find something to eat. The rain begins about an hour after I arrive. A continuous stream of soaked hikers appear: a group of men and male students from a high school in Ohio, a couple from the Netherlands, a father and daughter pair. The shelter is now over capacity. New arrivals see this when they poke their heads into the shelter and then retreat to pitch their tents in the rain. I am cold and get into my sleeping bag by dinner time. Tomorrow I will make up for lost mileage. Morning arrives and I get an early start. It’s bitterly cold in the high 30s and I have no regrets about the decision to stay dry at the shelter. I think about two of the hikers who stopped only long enough to eat lunch and then pushed on. I hope they are ok. I hike 9 miles, almost all uphill, and make it to Roan Mountain Shelter by lunch. The shelter is a log cabin with a sleeping loft. It is dark and shaded and feels eerie to me. I quickly eat and refill my water containers then head on. If I want to get back on schedule, I will need to walk 8 more miles to get to Overmountain Shelter which is a huge converted barn with great views. 17 miles is ambitious but if the weather cooperates, I think I can do it. I walk alone the entire day. I reflect a lot. I think about my life. It’s half way over. What do I want to do with the second half? My legs and feet ache as I push past Stan Murray Shelter determined to make it to the barn. After an embarrassingly slow pace, I see the sign for Overmountain Shelter. Not knowing if there will be a privy at the shelter, I decide to empty my bladder in the woods. I have learned how to squat and pee without having to take my backpack off. I am proud of this skill that saves time and is very efficient. I assume the position like a dozen earlier times but something is different. The weight of my pack is too heavy for my tired legs and they give out. My backside lands in the dirt as my bladder responds to the earlier signal to eliminate. I have no choice but to go with the flow so to speak. I look around once again for some hidden camera I believe the universe uses for moments just like this. I laugh at myself and the humor contained in the embarrassing moment. Eventually, I pick myself up and clean off. I head down the side trail to the shelter where I can now see other hikers and a beautiful view. My day is coming to an end. I see Paul and we agree to hike together the next day over Hump Mountain. It will be a relatively easy 9 miles that will take me to my truck. I need to get home before Easter.